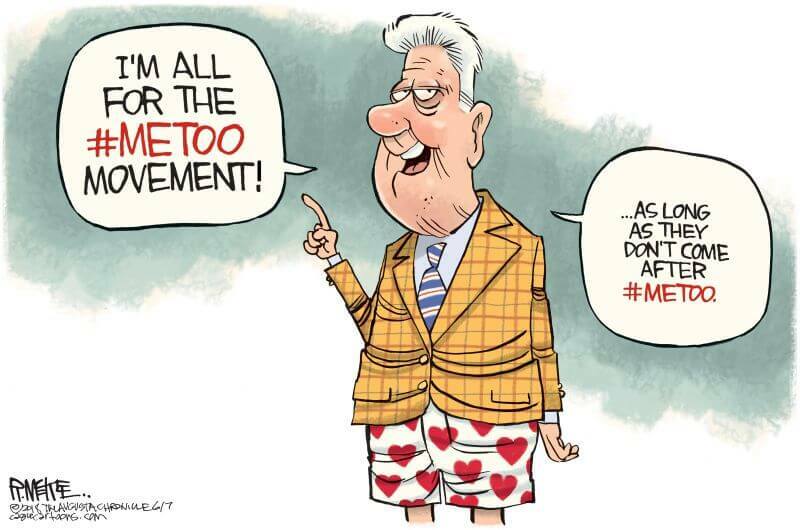 The cartoon below brutally sums up the hypocrisy of the Clinton’s when it comes to the #metoo movement and almost everything else. While the cartoon only shows former President Bill Clinton, the hypocrisy equally applies to Hillary and Chelsea as well. Former President Bill Clinton on Thursday played down the sexual harassment charges against former Sen. Al Franken (D., Minn.), charges that drove him out of office in January. PBS’s Judy Woodruff mentioned to Clinton that Franken’s ouster from the Senate showed that political norms are changing, and she asked him if that was a good thing. “Well, in general, I think it’s a good thing. Yes,” Clinton responded. He said perpetrators don’t have to physically assault somebody to make them uncomfortable at work and said recognizing that fact is good. Clinton didn’t see the Franken case, however, as being clear-cut. “I think that — I will be honest — the Franken case, for me, was a difficult case, a hard case,” he said. As we all know the Clinton’s are one of the most corrupt political families in modern American politics.